T-Mobile has nothing to do with tacos, but it turns out being a customer of the wireless carrier can score you some free Taco Bell. In one of a series of commercials during the Super Bowl, the company announced it’s teaming up with the Doritos Locos peddler to bring its customers free tacos every single week -- for an undisclosed length of time. The deal is one of many perks available to T-Mobile Tuesdays app users. This particularly deal -- for one free Crunchy Taco or Soft Taco -- has “no strings attached,” meaning you don’t have to buy anything to get your hands on the free food every week. 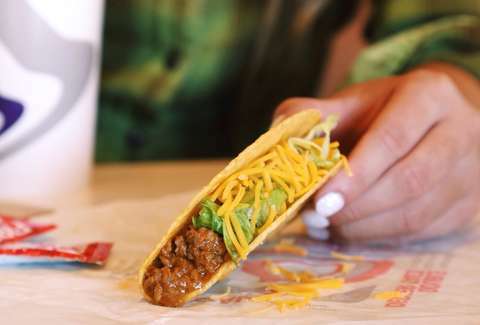 That said, there’s a slim chance you’ll end of leaving Taco Bell with just one taco (admit it). Previous freebies include free Domino’s pizza and free movie tickets. An end date for T-Mobile and Taco Bell’s collaborative freebie hasn’t been announced, but nothing gold can stay. According to the fine print this is a “limited time offer,” so take advantage while you can. No need to worry about a ride, either. T-Mobile is also offering $10 off Lyft rides via the T-Mobile Tuesdays app. Not a Crunchwrap connoisseur? Weird, but we’re not here to judge. T-Mobile is sure to announce another freebie deal as this one ends. All you have to do is download the T-Mobile Tuesdays app and watch the free stuff roll in.